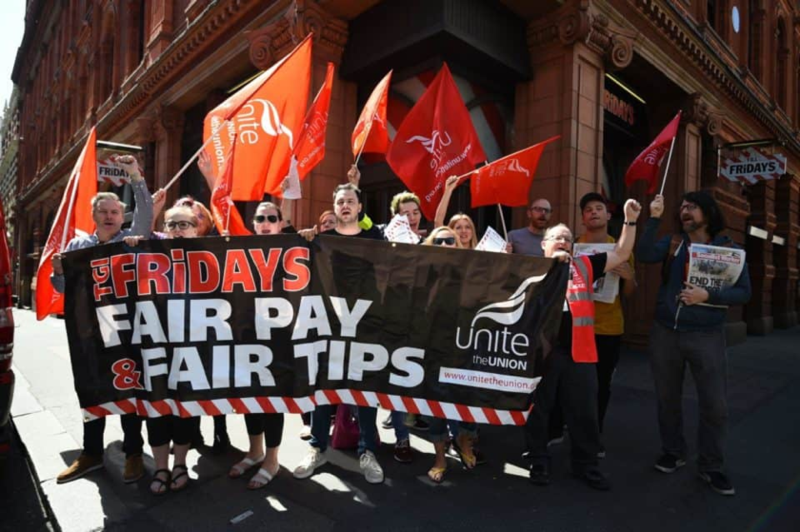 Staff working for the TGI Fridays restaurant chain have been on strike against a management decision over tips which is being resisted by waiters and kitchen staff alike. Protests were mounted outside restaurants in Covent Garden and Milton Keynes. Traditionally in the catering industry, those who wait on tables have been even worse paid than the kitchen staff, making them dependent on tips from customers to top up their wages. Now that the minimum wage has obliged TGI Fridays management to marginally raise the pay of waiting staff, kitchen staff not unreasonably expected a proportional increase in their own meagre earnings. Instead, TGI Fridays has dreamed up a scheme designed to rob Peter to pay Paul, with the transparent aim of dividing the workforce. Under the scheme, waiting staff will see 40% of their tips paid on debit and credit cards ‘redistributed’ to kitchen staff. Thus the tiny increase in waiters’ wages is more than wiped out by the loss of tips, resulting in as much as 10 or 15% overall loss of income. Meanwhile the kitchen staff are to be cheated out of their justified pay rise, fobbed off instead with a cut of the waiters’ tips. The striking waiters have refused to fall into this divisive trap, recognising that it is the management spivs that are to blame, not their fellow workers back in the kitchen. The comments of one waitress put it in a nutshell: "I absolutely think the kitchen staff should be paid more. 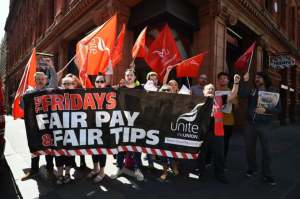 I just don’t understand why I am paying them" (Sarah Butler, TGI Fridays staff go on strike in UK’s first dispute over tipping, The Guardian, 18 May 2018). Staff also report how the company has shaved off other worker benefits (like extra pay for working bank holidays or leading a team) to compensate for having to pay the miserly minimum wage. What is driving this downward pressure on labour costs is cut-throat competition in an over-supplied casual dining sector. Rival chain Carluccio’s may be forced to close thirty of its restaurants for the same reason.